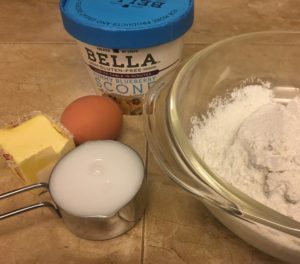 Bella Gluten Free sent me some of their baking mixes to try. While we don’t make a ton of treats these are good to have on hand, especially with kids. It also can encourage reading for younger kids as well as getting them in the kitchen. Cooking and baking is a life skill that I believe every kid should have. My daughter had a friend over during Christmas break, and she is Gluten Free. They each got to make a treat and then I split the cookies and brownies and sent her friend home with both. Bella Gluten-Free products are 100% gluten-free mixes created by celiac chefs who do not compromise on taste, texture or nutrition. 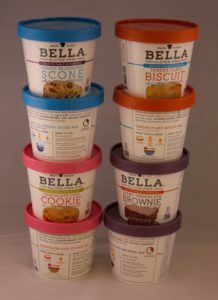 Bella Gluten Free dry mixes allergen friendly which i love. We have several sensitivities and this is a great product. The recipe calls for milk so we used almond milk, eggs and butter. We have also used ghee. Oldest Crazy Life kid used a flax mixture instead of egg since she is vegan, and they turned out just as delicious. 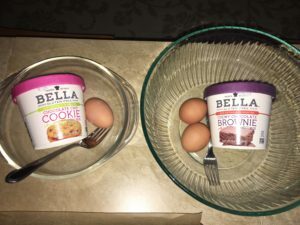 What I love most about Bella Gluten free baking mixes is they are NON-GMO certified, certified vegan, small batches and you don’t have a ton of junk hanging around the house for a long period of time. All you need is a bowl, a spoon and a couple common fridge ingredients! Each mix makes one batch and is designed to make quick and easy end products. The brownies and cookies were both done (from cup to plate) in under 20 minutes! Mary Capone is the founder and was diagnosed with celiac. She combines her gluten-free mastery with her love of the kitchen. Mary is a cookbook author, and nationally known instructor of gourmet gluten and allergen-free foods. She has celiac kids as well, so designed mixes with taste and texture that has healthy ingredients. Her articles and recipes have appeared in Living Without Magazine, The Herb Quarterly, Energy for Women, Eatingwell.com, Livingwithout.com, Delicious Living Magazine and Delight Gluten-Free. Her book, The Gluten-Free Italian Cookbook includes over 141 delicious gluten-free classic Italian recipes with 135 allergen-friendly variations. Click here to read more about the chefs.